Spain’s Costa Dorada (or in Catalan, Costa Daurada) is a beautiful coastal region which runs through a distance of 250 kilometres on Spain’s Mediterranean east coast. The Costa Dorada is endowed with golden beaches, which is why people call it the Spanish Golden Coast. Its beaches lie on the border with the Costa del Garraf on the north (which is just before the Costa del Maresme and the famous Costa Brava) and end at the Ebro Delta. On the Costa del Garraf, there’s the world famous Olympic city, Barcelona. The first coastal village on the north is considered to be Segur de Calafell and the most southern village, Alcanar. In between them, there are plenty of fishers’ villages and beautiful coastal resorts. Among others, you’ll find: Salou, with its great boulevards covered with palm trees and its exuberant night life, the charming and calm Cambrils, the cultural and historical Tarragona and, finally, Sitges, with its Romantic museum. The foothill of the Catalan coastal range forms the beautiful background of the Costa Dorada and shelters many traditional villages. 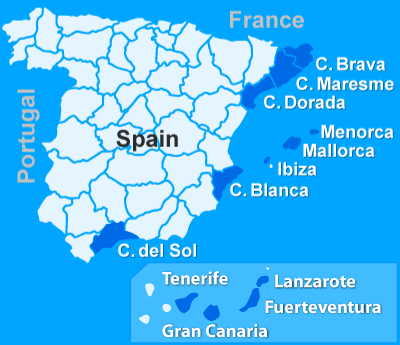 From the administrative point of view, the Costa Dorada is distributed between the provinces of Barcelona and Tarragona. The Costa Dorada’s inhabitants are mostly bilingual: although the official language is Spanish, most people also speak Catalan (the local language which also comes from Latin). Something very interesting to know is that most of its inhabitants consider themselves to be native speakers in Catalan, rather than in Spanish. Even though most Spanish people don’t like to miss a single siesta, the inhabitants of the Costa Dorada are a bit different. Most of them don’t have one, so the main shops don’t close during midday. Catalans’ life style is similar to other European countries. Women, for instance, actively participate in social and public life, just like in the rest of European countries. The Costa Dorada’s main industries are the wine production and fishery. Catalonia is, by the way, one of the most concentrated industrial areas in Spain. And because of the big success of the golden beaches, the Costa Dorada has become also one of the most important touristic centres. The Costa Dorada enjoys a mild Mediterranean climate with pleasant temperatures and most of the time a bright sky. During the summer season, temperatures range between 20 and 26 degrees, and during winter, between 7 and 10 degrees. The Costa Dorada is a wonderful part of Spain where the climate practically is always the same. This makes it ideal to enjoy an amazing holiday and a lot of outdoor sports. In the mountainous areas, temperatures are always a bit lower, of course. When, during winter, there’s a strong wind from the north-west, people call it mistral, mestral or serè. The breeze from the south-west is called garbí. These winds are the ones in charge of keeping the humidity low and also keep away fog. In the summer, it rarely rains on the Costa Dorada. Unfortunately, when it does rain, it can be torrential, and therefore overflow some rivers. Luckily, these rain showers are rather rare and disappear as fast as they appear. Most of the rainfall takes place during autumn and spring. The Costa Dorada is endowed with a great diversity of landscapes and with long golden sand beaches, a beautiful countryside and nature parks. The Costa Dorada’s nature parks are of incalculable value for the landscape. On the south, you’ll find the nature park of the Delta del Ebro and the National Park of Tortosa Beseit’s Harbours, where there’s plenty of exotic birds. The landscape is composed by beaches, bays, salt lakes, lagoons, rice fields and river islands together with all the wildlife living in this habitat. The Samà Park, between Cambrils and Montbrió, is the perfect place to recharge your batteries. Don’t forget to visit its caves and waterfalls. The Prades mountain range and the Serra del Montsant form the coast line’s background. Outside the Costa Dorada’s touristic centre, the picturesque paths will lead you through rock formations, moonscapes and densely forested areas where you can still observe the authentic, traditional villages. Even the underground is interesting in the Costa Dorada. In the village of Benifallet, you’ll find the Meravelles caves, six caves from different shapes and dimensions, where you’ll be able to observe impressive stalactites and stalagmites. The countryside is characterized by rice farming and vineyards, strewn with pines. Stone houses, Roman and Gothic monuments, Modernist buildings and small villages are the cultural heritageand economical base of the Costa Dorada’s countryside. The Costa Dorada’s mass tourism is obviously the one on the coastline, where small fisher’s villages have developed into true modern beach resorts with huge villas and apartments. The broad golden sand beaches are the Costa Dorada’s main appeal. Because of its shallow waters, it has also become the perfect holiday destination for families with children. Not only you’ll be able to relax in the sun, you’ll also be very entertained in sportive terms. The turquoise blue water invites you to splash inside and sail, surf, water-ski, kite surf, jet ski and many more. Luckily, on the Costa Dorada, there are also some calm beaches where you can avoid busyness and relax. A few examples are: the Eucalyptus beach in Amposta, the Punta del Fangar beach in Deletebre or the Waikiki beach in Tarragona. The Costa Dorada is filled with surprising cultural sights: In Tarragona, you’ll find plenty of relics from the times when the city used to be an important Roman harbour. The ruins, among which the amphitheatre, do now belong to the UNESCO’s world heritage. You’ll find more information about it at the National Archaeological Museum of Tarragona. Don’t forget to pay a visit to the beautiful old centre, the Sant Francesco clares monastery and the 12th century cathedral of Santa Maria, which, in 1900, became a Spanish national monument. Some interesting museums in Tarragona are: the Museo de la Vida Rural, which takes a glance through the daily life in the countryside, and the Museo del Port, which explains the harbour’s history from the Roman times till nowadays. In the historical village Tortosa, you can visit the 59 metre high Castillo de la Zuda, characterized by its Islamic influences, or the Santa María cathedral. If you want more, try a stroll around this calm and non-touristic site, and visit the Santa Clara monastery and the several palaces. Calafell’s narrow streets will lead you through medieval ruins and rocks. The most beautiful spot of this town is located on the way to the Santa Creu castle, where you’ll have an amazing view over the surroundings. In the beach resort Sitges, you should definitely visit the Romantic museum Can Llopis, where you’ll find a big collection of Romantic objects, like old carriages and bikes, old dolls, etc. In Torrelles de Llobregat, there’s the Mini-Catalonia Park, one of the top 10 attractions in this region. The Benedictine monastery of Montserratis located between a multitude of rock formations and at 700 meters high. The “Black Madonna”, in the basilica, is said to have special powers, which is why people from all around the world visit her. The Costa Dorada, just like everywhere else in Spain, is a paradise for wine tasters. Everywhere, you’ll find plenty of gastronomic possibilities in which olive oil, potatoes, vegetables and fruit are the healthy main ingredients of delicious meals. Restaurants are open during the whole day, and the Spanish cuisine is so diverse that, you’ll find dishes for everyone’s taste and budget. Dishes like paella, gazpacho, chuletas de cordero, caracoles con allioli or tapas like the tortilla, patatas bravas, calamares or gambas, are only a few examples. And tasty food needs to be combined with a nice wine from the region, of course. As an aperitif, try a glass of cava or sangria. Most Spanish people drink a wine called Penedés, or wine from Priorat and Tarragona. You can also try a local digestive like: Cuarenta y Tres, de Hierbas or a Carajillo (an espresso with brandy or cognac). Port Aventura is very famous because it has the highest roller coaster in Europe, the Shambhala. This challenging attraction goes at a top speed of 134 km/h and is 78 m high! Besides this adrenaline ride, this amusement park many other things to offer. This is the main reason why, every year, more than 3,540,000 visitors spend an unforgettable day in this imaginative park. On top of it, unlike other amusement parks, it is open almost all year round. This amusement park is located at only 1500 m from the centre of Salou, and its promenade and beach. The park is also easy to reach from other places; it’s at only an hour drive from Barcelona. Another option to get there is by train, as it has its own train station connected to the most important stations in the area. In addition to it, there is also a regular bus service. Get through the gates of Port Aventura and start a journey around the world. You can go from China, to the Far West, to the Polynesia, to Mexico, to the Mediterranean or to SésamoAventura. It will be an absolutely fantastic day during your holiday! Get excited and feel the adrenaline running through your body in one of the roller coasters or water attractions. A ride in the Shambhala is the limit! But there is more for you in Port Aventura like the Stampida (a double roller coaster made of wood), the Hurakan Condor (a free fall), the Dragon Khan (a roller coaster with 8 loops), the Furious Baco (an extremely fast roller coaster), and the Kon-Tiki Wave (a catamaran). Toddlers and preschoolers will really go crazy in SésamoAventura. They can meet famous characters like Bert, Ernie, the Cookie Monster, Elmo, and Grover. Of course, there are also awesome attractions for the whole family! Try out the Tami Tami (a little roller coaster) or go to one of the other areas to amuse yourself in a water attraction, like the Silver River Flume, the Tutuki Splash or the Grand Canyon Rapids. You’ll see more of the park during a ride in el Diablo Tren de la Mina (the speed mine train). Or you can also try the Sea Odyssey (a submarine simulation) or the Yucatán (similar to a carousel). Do you like to splash battle? Try the newest attraction, Angkor. Finally, you can walk through the park to go to the different themed area, of course, but you can also have a boat trip! Some examples of live shows you can visit are: the Templo del Fuego (a show with fire effects), China Town (with dancing and acrobatics), the Aves del Paraíso (a parrot show), the Aloha Tahití (a traditional Polynesian dance show), Xu Xop Xou (a Chinese puppets’ show) and Fiestaventura (a night show with fireworks on the main lake). Besides having so much to offer, next-doors, you’ll find Costa Caribe, a water park where you’ll be able to keep on with the fun. It really sounds like fun, doesn’t it? Make your holiday special and visit Port Aventura! From our own experience, we highly recommend you to buy the so-called Express ticket at the pay desk. You’ll pay a bit more, but it's completely worth it: it enables you to skip the queues and have more rides in the attractions instead of waiting all the time! Stylish and imposing holiday villa for up to 14 people, featuring lots of space, a huge private swimming pool and breathtaking sea views!